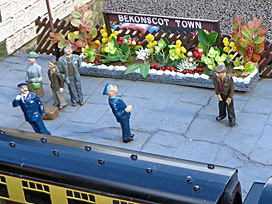 Generations of children have enjoyed a visit to Bekonscot model village since it opened to the public in 1929. The Queen came aged seven, back when she was merely Princess Elizabeth, whereas I think I first visited aged six. I remember being amazed by the little houses, and the little people, and of course the little railways. I also remember being taken to task by my infant school teacher when I wrote about my weekend visit to "Beconscot" on Monday morning. She said I'd spelt the name wrong, and I insisted I absolutely hadn't, in that way precocious six year-olds do. I've now recovered from the social trauma of that encounter, just about, so I thought it was time I went back as an adult and enjoyed Bekonscot again. The village entrance lies a short walk from the station, up an unassuming avenue of whopper-priced commuter homes. Bekonscot was built in the back garden of Mr Roland Callingham, a London accountant with a penchant for model railways. When his wife grew tired of the trains he rebuilt his layout outdoors, added some model houses for good measure, then added a pier to his swimming pool. The model village grew inexorably from that point on, more a labour of love than an accurate representation of reality. Roland's friends loved it, and encouraged him to open the place up, and the general public duly flocked in. Bekonscot thrived and grew, but was soon hemmed in by surrounding back gardens and remains one and a half acres in size. It's now run by a charitable trust, who've rolled back certain 'modern' amendments so that everything now reflects a bygone Thirties England. Are you ready to come with me? Let's go, then. Ah yes, the place looked very much as I remembered aged six, but much smaller. A mini-landscape of diminutive settlements spread out before me, including a windmill on a hill and a lake that used to be Roland's swimming pool. Mostly giant-free, because I'd thought to arrive early in the day before the day's rush arrived. And all very green, courtesy of some immaculate lawn and well-trimmed shrubs. A sprinkling of snowdrops and crocuses brightened the scene - it already feels like spring is here at Bekonscot. First up beside the entrance is Chessnade Zoo, including a now-out-of favour chimp's tea party plus a scale model of Lubetkin's penguin pool. Close by are a castle, a manor house and several rural cottages, plus umpteen roughly-painted little people engaged in everyday activities. The trick is to stop and look closely, not stomp around in 15 minutes flat, else you'll miss all the finer detail. 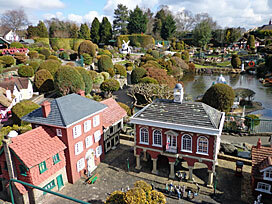 Bekonscot Town is the original heart of the model, with a warren of tiny streets set alongside the main square. It used to be possible to walk along all the back alleys, but the narrowest are now sealed off to prevent damage. Pause awhile to read and enjoy the punning shop names. The baker is Ivan Huven, the shoe shop is Evan Leigh Soles, and the newsagents is Daley Read. Not everything's fictional - the town boasts Britain's smallest Marks & Spencers, and the furniture removal company is Beaconsfield's own. And there are railways, seemingly everywhere, ducking beneath the footpaths and running round the lakeside. Every minute or so a model train goes by, then rumbles out of sight round a corner or into a tunnel. Small boys are transfixed by the display, and one much larger boy has the job of sitting in the full-sized signal box controlling them all. Follow the arrows round to enjoy a fairground, an airfield and a circus. One thatched cottage in the central hamlet has a habit of catching fire, with smoke billowing from its roof and the fire brigade in attendance. A tram rattles along the lakeside, while a very successful cablecar ferries passengers down from the scout camp to the canal basin for a ha'penny fare. The best view of the site is from a raised walkway on the far side near the tearooms, so make sure you nip up there at least once. Almost every kind of building is reproduced here - a school, a country house hotel, even Ascot racecourse. There's even a functioning colliery... or at least a series of conveyor belts to shift tiny chunks of coal, overlooked by a series of northern-style stone terraces. And yes, that is indeed a reproduction of the Sydney Harbour Bridge, because Bekonscot is nothing if not a unashamed mishmash. And then the school parties arrived, streaming in from the picnic area. I should have realised that visiting midweek wouldn't be quiet, and soon it was anything but. Bekonscot is a particular favourite for infant class trips, wandering round in small groups led by a parent in a hi-vis tabard. Some had worksheets to fill in ("I've found the church, here it is"), others got to choose which small building they'd like to have their photo taken in front of. Most of the other visitors were families with small children, indeed there were no other single middle-aged men wandering around feeling somewhat conspicuous. But much braver was the group of teenage girls who'd come to model fashionwear for a school project. They hovered suspiciously, then whipped off their onesies to stand shivering beside a variety of buildings - models in a model village, very clever. Other things to do include riding on a miniature railway, safely tucked round the back so as not to spoil the main illusion. You can peer in at the workshops where all these models are created and repaired - it's a massive job keeping the place in good shape. The gift shop is housed inside a railway carriage and is an Aladdin's Cave of kid-friendly trinkets. Adults should hunt down a copy of the official guide book, which is poorly promoted, but which at £1.50 is quite the best value guide book I've ever come across. If you have time, wander a mile down the road (past the station) to Beaconsfield Old Town, some of whose quainter buildings are reproduced in the model village. But don't pop round to Enid Blyton's old house. She really did live on the other side of the lane for 30 years, in a mock Tudor mansion called Green Hedges, but after her death the land was sold off and a cul-de-sac of unmemorable homes erected instead. Green Hedges survives only as a one-twelfth scale model at Bekonscot - the Enchanted Village.